Top button LCD Atomic Talking Watch has an amazing atomic accuracy. It setsitself including adjustment for daylight savings time. Your talking watchclearly talks the time day date month and year and signal reception status ina pleasant male voice at the touch of a button. The SENSES atomic talkingwatch is great for anyone with a visual problem and is good for time readingin low light condition. Time and calendar of the talking watch are setautomatically by the radio Atomic clock signal that is broadcasting on the airthrough an antenna set up in the country. Never Sets Your Watch Again. Easy-to-read LCD digits. 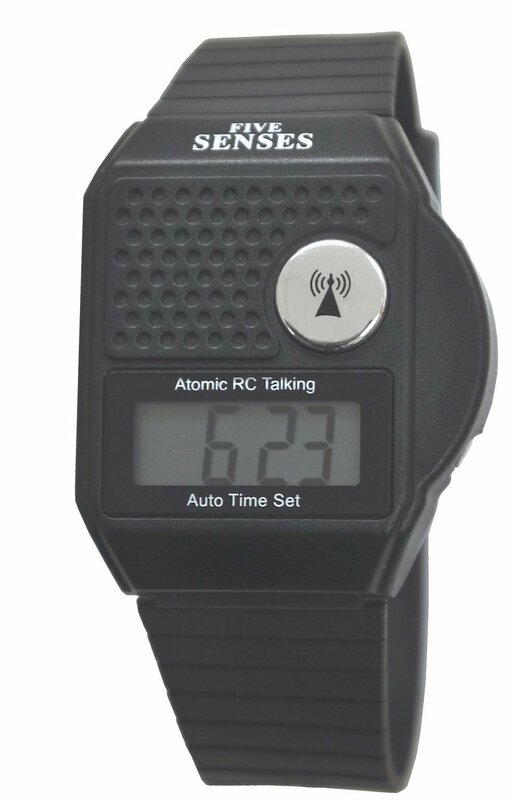 The Atomic Radio Controlled digital Talking Watch onlyuses one battery (included) for the movement of digital display and digitalvoice. Please note: Atomic signal from Ft. Collins Colorado is not able toreach states of Alaska and Hawaii (and country of Canada) but the watch timecan be set by user manually. However, calendar function will not work withoutan atomic signal. Buyers from these States and country of Canada arerecommended to buy SENSES advanced VHAS non-Atomic talking watch or our easy-to-touch front button LCD digital talking watch. Please visit and select VHAS Talking Watch (on the Home page of the OurCategories) for details. Our Customer Service provides battery replacement toease your work! Of course, you can buy battery on the foreasy battery replacement at home. ALL WATCHES ARE TESTED BEFORE SHIPPING BYTimeChant (Hong Kong) Limited a company of the New York Standard Watch CompanyLLC.